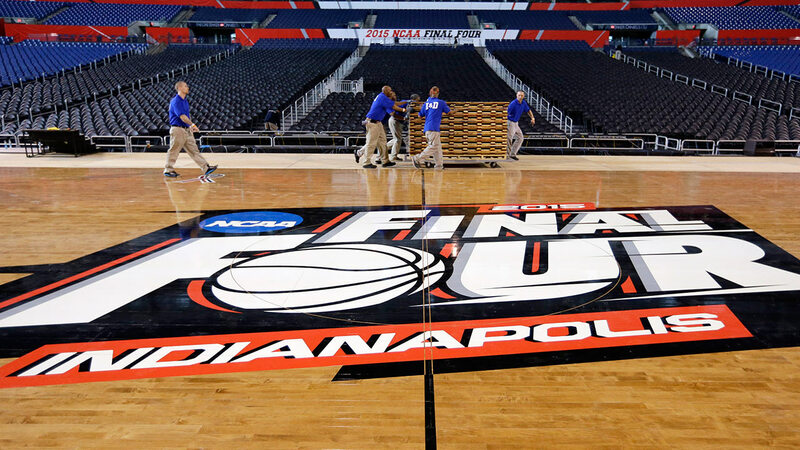 INDIANAPOLIS -- The Duke Blue Devils join the Michigan State Spartans, Kentucky Wildcats and Wisconsin Badgers in the Final Four of the NCAA Tournament. The Blue Devils and their trio of freshmen starters are going to their 16th Final Four after a 66-52 win Sunday in the South Regional over Gonzaga. Justise Winslow, the freshman playing home in Houston, had 16 points, including a big 3-pointer in the closing minutes. Matt Jones had also had 16 points while freshman Tyus Jones had 15 points, while Jahlil Okafor nine points and eight rebounds. Duke (33-4), the region's No. 1 seed, is going to Indianapolis to play Michigan State in the Final Four. The other national semifinal game Saturday matches undefeated Kentucky and Wisconsin. Coach Mike Krzyzewski is going to the Final Four for the 12th time, matching UCLA's John Wooden for the most by a head coach. Duke's last Final Four and national title was in 2010, when the Blue Devils were also the No. 1 seed in the South Regional and had to go through Houston. "This is a magical moment for us, but we played a magical team in Gonzaga," Krzyzewski told the crowd. No. 2 seed Gonzaga (35-3) had taken a 38-34 lead less than 4 minutes into the second half, putting the Blue Devils in their largest deficit of this tournament. The young Blue Devils responded with nine straight points and never trailed again. They had stretched it to 60-51 when Winslow made a 3-pointer from the left wing with 2:28 left. "I want to thank Houston for giving Justise a huge birthday present," Krzyzewski said of the forward who turned 19 on Thursday, the day before he had 21 points and 10 rebounds in a 63-57 win over Utah. Gonzaga, in its 17th consecutive NCAA Tournament, was trying to get to the Final Four for the first time. This was only Gonzaga's second regional final, and its first since 1999, when the mid-major Bulldogs were a No. 10 seed that lost to top-seeded UConn. Mark Few was an assistant coach on that squad, and took over as head coach the following season. The Zags, a No. 1 seed only two years ago before losing to Wichita State in their second NCAA game, missed out again. It was the final game for seniors Kevin Pangos and Gary Bell Jr., who had both played at least 135 games for Gonzaga. They were a combined 4-of-14 shooting for nine points. Kyle Wiltjer, the transfer from Kentucky who as a freshman was part of the Wildcats' 2012 national championship, had 16 points for Gonzaga. Byron Wesley had 10. Wesley, the other Gonzaga senior starter who had transferred from USC for his final season, picked up a loose ball and made a layup while being foul. His free throw made it 38-34 with 16:20 left. Duke's comeback stretch included a tiebreaking 3-pointer by Matt Jones on an assist from Tyus Jones, who then had a nifty play to get Duke the ball back after Przemek Karnowski had initially grabbed a defensive rebound before falling to the floor. Tyus Jones leaped in the air to grab the loose ball, and dropped it straight down on Karnowski laying out of bounds. Okafor then made a jumper to put the Blue Devils back up 43-38. Gonzaga: Domantas Sabonis had seven points in a 14-4 run that got the Bulldogs with a point before they didn't score in the last 3:50 of the half. The 6-foot-10 freshman then had a spurt of less than 2 minutes when he lost a pass out of bounds, missed a point-blank shot, drew a charge, and then had two offensive fouls. Duke: It was the 103rd NCAA Tournament win for Duke, third all-time behind Kentucky (119) and North Carolina (112). ... The Blue Devils led 31-26 at the break, even while making only two of their last 15 field goals of the half after a three-point play by Okafor that put them up 23-12 with 11:44 left. Duke: Play Michigan State (27-11) on Saturday at the Final Four in Indianapolis.